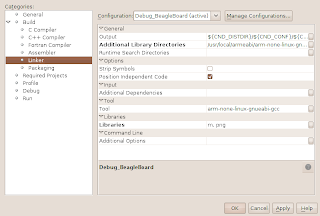 It is important for an embedded programmer to have a good IDE with cross compiling ability. The eclipse can do this, and NetBeans also can do. 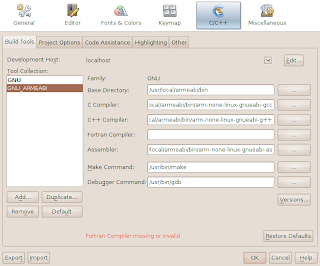 You can configure the tool chain of NetBeans in [Tools/Options] menu item. 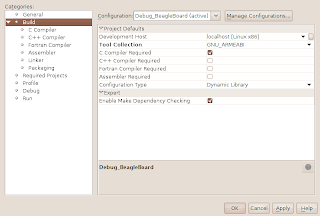 In Options panel, the tool chain setting can be found at C/C++ tab, like the following image. To create a tool chain setting, we need to press "Add" button and choose the root directory. It is very important to know that the root directory is the directory where as, gcc, g++ exist. So, in this case we choose "/usr/local/armeabi/bin". After the configuration of tool chain, we need to configure the NetBeans project to use this tool chain. To do this, we can open the NetBeans project properties by right-click it, choose "build" item and select the created tool chain item at "Tool Collection" combo box. 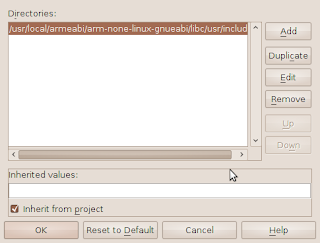 While everything is done, it is easy to compile your project into ARM environment.